The following businesses participate in RNRA’s exclusive My River North mobile app. We deeply appreciate their partnership and encourage all residents to patronize these terrific local establishments. The deals shown below each listing are only available to app users through their mobile devices. To learn more about My River North, click here. 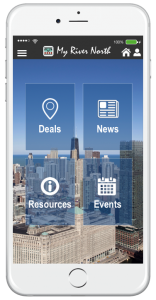 The “My River North” mobile app provides convenient access to River North news, events and resources, plus special discount offers at a variety of participating local businesses. The app is FREE for all users and is compatible with virtually any mobile device. Using your mobile device, download the app from the App Store or Google Play.